Many people do not want to wear glasses, and it’s a well-known fact that your self-esteem is closely linked to your physical appearance. So much so, that if you don’t feel happy or confident wearing your glasses, it can affect your personality, performance at work or even your involvement in sporting activities etc. Many people benefit from wearing contact lenses, giving them freedom without glasses. Could they work for you? Contact Brady Opticians, your local contact lens specialists today on 074 9721727 to discuss your suitability. At Brady Opticians, we make wearing contact lenses simple. Our forte is customer service, so if you’re already a contact lens wearer, or even if you have never tried them before, we will make certain that we find the right contact lenses for you. Throughout the process we are here to help, giving honest impartial advice, and as an independent optician we are able to source practically any contact lens in the marketplace whether that be for occasional use such as playing sport or for full time use. We want to ensure that you leave our practice happy and confident in your newly found freedom from glasses. Why Choose Brady Opticians for Contact Lenses? • Relax; you’re in experienced and professional hands. Our contact lenses specialists are experts in their field with vast knowledge on all types of contact lenses and designs, making the switch from glasses never simpler. • Why not use our ‘try before you buy offer’? Simply book in for a consultation with one of our opticians and they will advise you on the type of contact lens, which will best suit your needs and lifestyle. Once you are happy with your choice of contact lens a trial pair will be placed on your eyes ensuring that you are comfortable and your vision is sharp and crisp. Our optician will then show you how to place them on your eyes and remove them by yourself, so you can trial them at home. 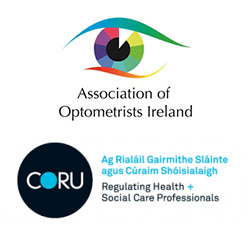 Our normal consultation fee is €35, which includes trial contact lenses for 10 days. • We are always looking at ways to offer you even greater value in contact lenses. That’s why we have our easy payment lenscare option available in store. Using this method you pay monthly and avail of great savings including free contact lens check ups and free replacement contact lenses should your happen to lose or tear a contact lens. See in store for details.